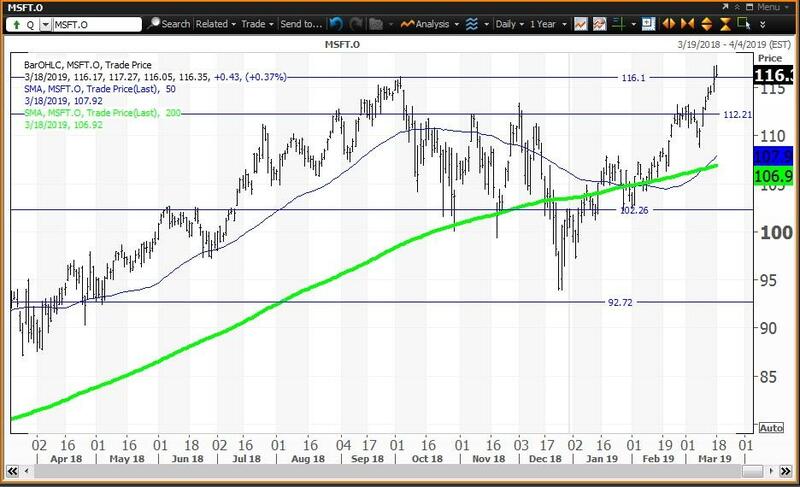 Microsoft held its quarterly pivot at $116.13 Monday morning but is below its risky level for March at $119.29, where investors should reduce holdings on strength. Microsoft Corp. (MSFT - Get Report) traded to a fresh all-time intraday high of $117.27 Monday morning. The low held my quarterly pivot at $116.13, but is below my risky level for March at $119.29, where investors should consider reducing holdings. Microsoft is the largest company by market capitalization and is a major component of all three of the major averages. Microsoft closed Friday up 14.1% so far in 2019, in bull market territory 23.4% above its Dec. 26 low of $93.96. The Dow Jones Industrial Average closed Friday up 10.8% year to date and 19.1% above its Dec. 26 low of 21,712.54. The S&P 500 closed Friday up 12.6% year to date, in bull market territory 20.3% above its Dec. 26 low of 2,346.58 when it dipped into bear market territory. The Nasdaq Composite closed Friday up 15.9% year to date, in bull market territory 24.2% above its Dec. 24 low of 6,190.17 when it was in bear market territory. Microsoft never fell into bear market territory as it declined 19.1% from its Oct. 3 high of $116.18 to its Dec. 26 low of $93.96. One reason to like Microsoft is the ownership of LinkedIn professional social media platform. With Facebook Inc. (FB - Get Report) and Twitter Inc. (TWTR - Get Report) facing security and content issues, LinkedIn should be gaining market share. The LinkedIn premium product I subscribe to costs $575 annually. My complaint is that you are limited to 30,000 connections. Microsoft is a holding in Jim Cramer's Action Alerts PLUS Charitable Trust Portfolio. Want to be alerted before Cramer buys or sells Microsoft? Learn more now. "We believe the cloud to be a secular growth trend and that upside to shares will result from Microsoft's hybrid cloud leadership as the company grab's market in this expanding industry. While companies may look to build out multi-cloud environments, Microsoft's Azure offering will be a prime choice thanks to the company's decision to provide the same "stack" used in the public cloud, to companies for their on-premise data centers. Slowdown in IT spending, competition, cannibalization of on premises business by the cloud are among the risks," says the Action Alerts PLUS research team. The daily chart for Microsoft showed the formation of a "death cross" back on Feb. 4, but the stock never closed below the 200-day simple moving average, making this bearish signal suspect. This false signal was followed by a "golden cross" on March 12 which tracked the stock to its all-time intraday high of $117.27 set on March 18. A "golden cross" occurs when the 50-day simple moving average rises above the 200-day simple moving average, indicating that higher prices lie ahead. When the stock traded to its Dec. 26 low of $93.96 and closed that day at $100.56, a "key reversal" occurred as this close was above its Dec. 24 high of $97.97. The Dec. 31 close of $101.57 was an important input to my proprietary analytics. My annual value level is $92.72 with my semiannual pivot at $102.25 and my quarterly risky level, now a pivot at $116.13. This quarterly level was not tested until Friday, March 15. The close of $112.03 on Feb. 28 was input into my analytics and resulted in a monthly risky level at $119.29 for March. My risky level for Feb. at 114.39 rolled out of the analytics. My weekly value level is at $112.22. 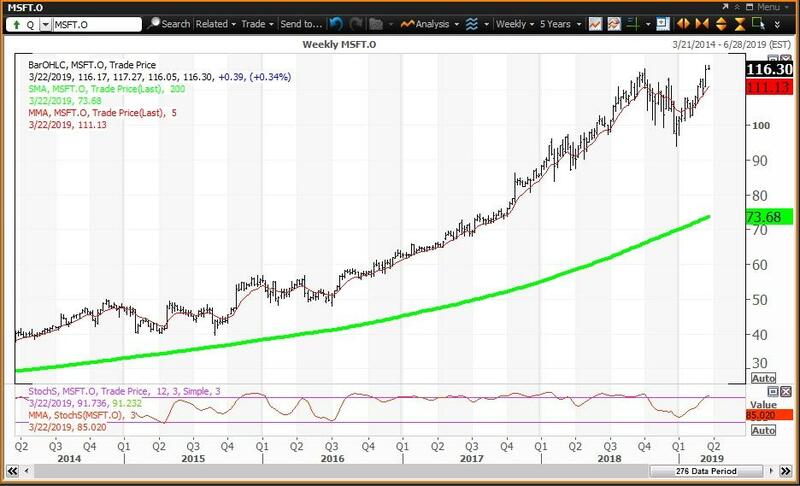 The weekly chart for Microsoft is positive but overbought, with the stock above its five-week modified moving average of $111.24. The stock is well above its 200-week simple moving average or "reversion to the mean" at $73.68. The 12x3x3 weekly slow stochastic reading is projected to rise to 85.32 this week up from 81.66 on March 15. If this reading rises above 90.00, the stock will become an "inflating parabolic bubble". Trading Strategy: Buy weakness to my weekly and semiannual value levels at $112.22 and $102.25, respectively, and reduce holdings on strength to my monthly risky level at $119.29. Note that my quarterly pivot at $116.13 held at Monday's low. My value levels and risky levels are based upon the last nine weekly, monthly, quarterly, semiannual and annual closes. The first set of levels was based upon the closes on December 31. The original quarterly, semiannual and annual levels remain in play. The weekly level is changed each week; the monthly level was changed at the end of January and February. My theory is that nine years of volatility between closes are enough to assume that all possible bullish or bearish events for the stock are factored in. To capture share price volatility investors should buy on weakness to a value level and reduce holdings on strength to a risky level. A pivot is a value level or risky level that was violated within its time horizon. Pivots act as magnets that have a high probability of being tested again before its time horizon expires.